On all things Boston. Especially our Red Sox. Let’s get the small stuff out of the way first. We non-tendered Bailey and Kalish. Also, congratulations to Lackey on a well-deserved Tony Conigliaro Award. Not that that’s a small achievement, but it’s not disturbing and alarming like the big news of the week. This week, we’ve had to deal with some significant departures. This is going to be rough. Jarrod Saltalamacchia is our first departure. He is now a Florida Marlin, having signed a deal for three years and twenty-one million dollars. We acquired him as a veteran, and now he leaves as a veteran having helped us win the World Series. Last year, Salty batted .273 with fourteen homers and sixty-five RBIs. He posted a fielding percentage of .994 and a catcher’s ERA of 3.88. But as with all great catchers, he contributed innumerable qualities like leadership and work ethic and skill with calling games and managing pitchers. Needless to say, the last three years, including October, would have looked very different without him, and he will certainly be missed. Salty, we thank you, and we salute you. We welcome AJ Pierzynski, who has signed a one-year deal pending a physical. Last year, he batted .272 with seventeen homers and seventy RBIs. He posted a fielding percentage of .998 and a catcher’s ERA of 3.63. He’s gritty, and he’ll fit in just fine. We also welcome Edward Mujica, the righty reliever, who signed a two-year deal for $9.5 million. Our other departure is different. This isn’t someone we brought in who has now decided to leave for a three-year contract. We say goodbye to someone we raised, who spent his entire career thus far with us, and who didn’t go to just any team. Jacoby Ellsbury is now a New York Yankee. It’s basically the same old story. They lured him over there with the type of contract that only the New York Yankees could provide: seven years and $153 million. So the Evil Empire offers these contracts like it’s made of money, since it basically is, and no other team can compete with that. I mean, it’s not like we haven’t seen this before. A star center fielder who bats leadoff and makes spectacular catches and helped us win the World Series and who is a Boston icon leaving for the dark side; where have I seen that before? It’s just awful. Our job is to raise players in the farm so they can stay here. Out job is not to raise players in the farm so they can win a ring and then just leave and give their services to the highest bidder. That was never what baseball was supposed to be about. But that’s the reality in which we and the game find ourselves now. It’s not our fault that we choose to be a responsible team that conducts itself in a responsible way. A contract worth that many years and that much money does not allow for much flexibility, which is what you need if you’re going to win. Think about our performance over the course of the past decade. Think about our performance over the course of the past year, about the acquisitions we made last offseason and where they led us in October. We should feel good about our success and about the business model and strategies that got us there. Hindering our flexibility by committing almost a whole decade’s worth of years and millions of dollars in three digits has not, historically, been one of those strategies. That doesn’t mean there’s something wrong with us. It means there’s something wrong with them. Let’s take a moment to celebrate Ellsbury’s achievements in Boston. He’s been hurt, but he has always powered through in true dirt-dog fashion, never shying away from making the tough plays no matter what mind kind of pain waited as a consequence. In his career, he’s bagged .297 with sixty-five homers and 314 RBIs. He has led the American League three times in steals. And he made only three errors last year. He helped us win not one but two World Series championships, making his presence seen and felt in both. I don’t think we’ll ever forget the way he patrolled Fenway’s center field with ease and made it look as easy as it really was for him to make catches that didn’t even seem to be humanly possible. His seven years are up, and now he’s joined the darkness. Ellsbury, we thank you, and we salute you. But we feel disappointed, insulted, and betrayed. Fortunately, Napoli is coming back. So there’s that sign of hope and optimism. In other news, the Bruins lost to the Habs, 2-1, but beat the Penguins, 3-2, and the Leafs, 5-2. The Pats just barely, and I mean that in every sense of the phrase, eked out a win against the Browns, 27-26. It really went down to the wire. Seriously. This week was momentous. This time of year usually is. Because this week, my friends, we celebrated Truck Day! On Tuesday, all of our equipment rolled out for the long drive down to Fort Myers. Spring Training has officially unofficially started! Man, it’s been a long winter. It still is a long winter. And we have a long way to go, but we’re getting there. It’s February already, and since Truck Day has come and gone, Pitcher and Catchers is our next milestone, followed of course by the officially official start of Spring Training and then the season! We’re well on our way. It may be freezing outside, and there may be snow in the air or on the ground, but we know that in Florida there is baseball to be played. I can almost taste it, especially since Farrell is already talking about lineups; expect Ellsbury to bat first this year. Pedro Martinez is back in Boston, in the front office this time; he’s a special assistant to Ben, and he’s basically going to advise the pitching staff. Kalish had successful surgery on his right shoulder, but we re-signed Sweeney just in case. We signed Lyle Overbay to a minor-league deal. Terry Francona won the Judge Emil Fuchs Award, presented by the Boston Baseball Writers, for his service to the game. Gary Tuck, our bullpen coach, decided to retire and has been replaced by Dana Levangie. Remember him? Levangie was our bullpen coach for eight years, the last of which was 2004. After that, he was an advance scout. And now he’s back where he started. Tuck was going to be the last man standing from last year’s staff, and he surely was a fantastic bullpen coach. He expected nothing but the best from pitchers and catchers; he made our staff great, and he will be sorely missed. Levangie has big shoes to fill, but seems like the logical choice. Congratulations to the Red Sox and the Jimmy Fund, who celebrate sixty years of partnership this season. This will be the inauguration of a suite available all season long for Jimmy Fund patients and their families. A Jimmy Fund Chorus will also perform at the park. This is one of those occasions when you feel really proud to support this organization. Okay. There’s something else that needs to be said, and I’m only going to say it once and then be done with it, because it’s that excruciating. Kevin Youkilis is now a Yankee. 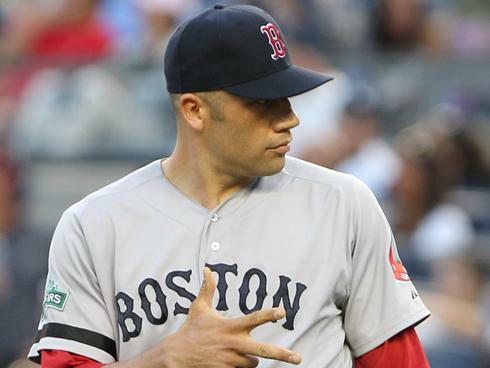 Like his predecessor, Johnny Damon, he has enlisted in the Evil Empire. He has committed himself to the aiding and abetting of New York’s success. Baseball is a complicated business these days; it’s a rare and happy find to discover a player whose sentimental connection with a particular team is strong. In Boston, we’ve had a long tradition of such sentimental connections, and we still expect that from our players; we give them everything we’ve got, and we like to see the same in return. So when one of our own, a homegrown farm boy no less, goes to the dark side, it’s extremely difficult to accept. It was difficult to accept Damon doing it, and it’s no less difficult now. 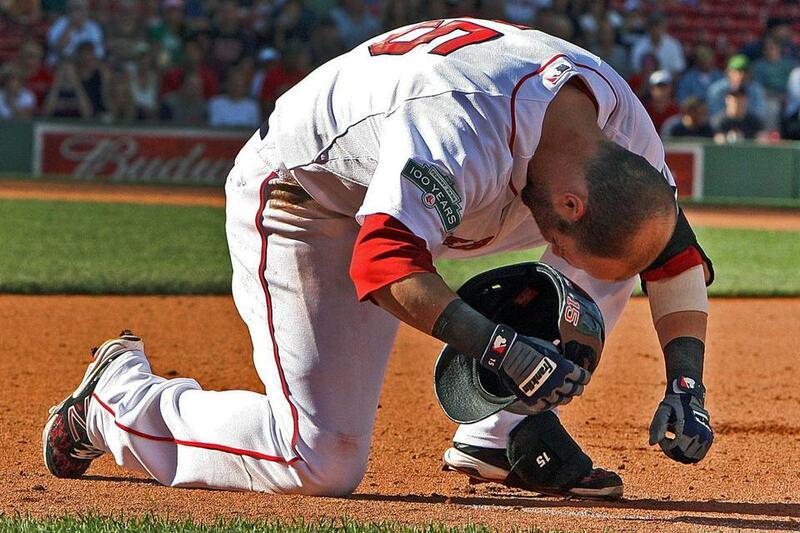 We salute Youk and everything he has done for this team and this city. He was a potent combination of hitting and fielding, volatility and versatility. He had his good moments, and he had his bad moments, but he has left a legacy here of a stellar player. I already made the tribute when he left, and we all know how awesome he was. All I’m saying now is that it hurts. It hurts, and it’s devastating, and we have to go through that pain all over again of seeing one of our own turn away from us. That’s all I’m saying. In other news, the Ravens won the Super Bowl, 34-31. What a game. It looked like the 49ers didn’t have a chance for most of it, and then it looked like the Ravens would be hard-pressed to keep them down after the power went out. But alas, they pulled through. At least now we get to say that it took a Super Bowl champion to defeat us this year. The Bruins, for their part, have been doing quite well. Since the shortened season’s first game, the Bruins have beaten the Jets by a score of 2-1, the Isles by a score of 4-2, the Canes by a score of 5-3, the Devils by a score of 2-1, the Leafs by a score of one-zip, and the Habs by a narrow yet satisfying score of 2-1. We lost to the Rangers, 4-3, in sudden death and to the Sabres by the brutal score of 7-4. It’s a sad, sad day when your goal for the season’s end is just to stay out of last place. And it’s even more sad when you’re in the process of failing at that goal. This series with the Jays was a big opportunity for us to make a dent and claw our way out of the basement. Our loss last night didn’t exactly help our cause. Unfortunately, it’s very simple. The Jays scored. We didn’t. The end. Lester took the loss. He gave up three runs on four hits while walking one and striking out seven over the course of seven innings. So it was a very solid, very quality start, and it should never have been the case even remotely that it would be possible for us to lose. The problem was entirely the seventh inning, and objectively speaking, even the seventh inning wasn’t all that bad. Neither team scored through six and a half, so it was a pitcher’s duel if there ever was one. For our part, we had two men on base in the first and fourth, one on base in the second and seventh, and none on base in the third and fifth and sixth. For his part, Lester was in absolute cruise control. His stuff was as good as I’ve ever seen it; he looked like his old self again, and his struggles this year seemed like distant memories in comparison to how he was throwing. I mean, his cut fastball, which is the natural and default indicator of his performance, had that characteristic sharpness and bite and movement that makes it so fatal for opposing hitters and so hard to read and hit. He allowed a double in the third, gave up a walk and made a throwing error that resulted in a second runner in the fifth, and went one-two-three in the first, second, fourth, and sixth. The seventh inning was what did us in. Admittedly, maybe if we’d managed to get to the Jays before they’d gotten to us, their getting to us for as many runs as they did may not have had to have been a problem. After two quick outs, Lester gave up a single, which may as well have been a double thanks to a stolen base. Sure enough, it turned into a run on a single in the next at-bat. And then he gave up a two-run home run before ending the inning. We singled twice in the top of the eighth with one out, but it ended thanks to a double play. The badness continued for our pitchers in the eighth, although it wasn’t nearly as bad as it could have been. Bard came on to replace Lester and gave up a double on his very first pitch followed by an RBI single that was stretched in a double thanks to a fielding error by Kalish. He then gave up a four-pitch walk before Miller replaced him. Miller got the inning’s first out but put runners at the corners in the process. Atchison then came on and gave up an RBI single before ending the inning. And we went down in the top of the ninth. The final score was five-zip. The fact that we couldn’t come up with an answer to that, or any answer to anything at all, is the sad part. Lester hurled a gem. Lester hasn’t hurled a gem in way too long a time. And he finally did in a game that was an opportunity for us to actually sweep a team, let alone win one just to avoid being swept ourselves. And we just couldn’t get it done. Instead of us being the sweepers, we had to settle for a series win, which is still more than we’ve gotten lately. If that were all, I could deal with it. But there’s more. As of last night’s loss, we are officially eliminated from playoff contention. It is now a certifiable impossibility for us to play postseason baseball this October. Is is the indisputable, cold truth that will usher in a long, hard winter. I think I speak for all of Red Sox Nation that it’s something that we’ve known would happen for a while now in the sense that this is not a surprise. Obviously there was still the believing and the keeping of the faith to be done, but at the end of the day, the team’s performance was the team’s performance. This whole season has just been so epically frustrating. None of the players who were supposed to deliver, delivered. All of the players new on the scene have delivered recently but it’s too little too late. Is it the players? Is it the manager? Is it the brass? We’re on the outside, and we don’t know what goes on behind closed doors, so who’s to say? But let’s not kid ourselves. I knew since our previous offseason that something was wrong. It just didn’t feel right. I wanted to be wrong about that because I wanted us to do well, of course, but there was something that was just off. But that doesn’t help things; no matter what, the results are the results. We are now out of the playoffs officially. And even though we knew that this was coming, it’s still painful when it finally happens because, like I said, there’s always that possibility lurking in the back of your mind, that perhaps it really isn’t too late for the team to pull it together. But every time we’ve thought that this year, it hasn’t happened. And now we’ll have nothing to show for it but a pathetic battle for second-to-last place so that we can at least preserve some measure of our dignity. And what makes all of it even worse is the fact that the Yankees are still in it. We didn’t even have an impact on anything October-related. And now we’re going to have to sit back and watch as other teams that are no ours are still playing a month from now. I’m telling you, I don’t care how not-surprising it is or how much we saw this coming. It still hurts. It’s humiliating and embarrassing and painful and devastating, and it hurts. It doesn’t just hurt because of the simple fact that our season will end when the regular season ends. It also hurts because we never even had a chance. In other news, the Pats lost to the Cardinals in a close one, 20-18. We lost again. How ’bout that? Only this time it was even more painful than usual because this time we could have won easily. Except that, really, it can’t be more painful than usual since we’ve had plenty of losses like this one as well. So really it’s just another in a long line of diverse and painful losses. But seriously, this one was really bad. Like, it was really, really bad. We seriously were so close to winning; all we had to do was hold on. But I’m getting ahead of myself. We scored first. Ellsbury was dropped in the lineup but produced anyway; with one out in the second, Ross walked, and then Ellsbury went deep on a changeup to right for two runs on one swing. It was awesome. We haven’t seen power from him in a while, so it’s good to know he’s still got it. Meanwhile, Buchholz was on a roll. The extent of the Jays’ threats during the first two innings was one walk in each, and then they singled in the third before finally scoring in the fourth. Unfortunately, they erased our two-run lead in the process and established a one-run lead of their own. After securing the inning’s first out on a three-pitch strikeout, Buchholz gave up three consecutive singles that brought in one run, a sac fly that brought in the tying run, and another single that brought in the go-ahead run. Both teams then went down in order in the next two half-innings. Kalish walked in the fifth, but the inning ended with a pickoff. Buchholz took down the Jays in order in the sixth, and then Pedroia tied the game at three with a solo shot in the bottom of the inning, going deep on a slider, his second pitch of the at-bat, which sailed out toward the Monster. So all three of our runs were scored via the long ball. Both teams then went down in order until the top of the ninth. Buchholz induced a groundout to start it off. But then the badness happened. It was the badness that would cause us to lose the ballgame. He gave up a single, which may as well have been a double thanks to a steal. He then gave up another single, which also resulted in a steal. He then issued an intentional walk to load the bases. Now, in the grand scheme of things, what happened next would have been considered a fantastic play given any other circumstances. Buchholz gave up a sac fly, which scored a run. Normally, you accept the fact that, with the bases loaded, you take the out even if it means you allow a run, and if you escape from that situation after having allowed only one run, you’re in great shape. The problem is that, sometimes, you’re in a tie situation and that run is the dealbreaker that decides your fate. So given the circumstances, during any other season, this loss would have to have been accepted as a loss that you sometimes have to expect to endure. But this is not any other season. This is a season during which we’re losing as much as we’d have been winning during any other season. And so it’s worse. Much, much worse. Tazawa issued a walk and then ended the inning on a strikeout. We failed to score in the bottom of the ninth, so we lost, 4-3. The irony, of course, was that Bobby V. came out to the mound with one out in the ninth and Buchholz was convinced his night was done. It begs the question of what would have happened had Buchholz been right. At the time, I think I speak for all of Red Sox Nation when I say that, at the time, we had no reason to believe that the ball should be taken away from him. Hindsight, of course, is always twenty-twenty. We just got swept. In other news, now that the regular season is underway, let’s talk about the Patriots! In preseason, we beat the Saints but lost to the Eagles, Bucs, and Giants. Fortunately, we started the regular season off right, beating the Titans, 34-13. Doubront started out so well, but oh, how the mighty have fallen. For almost all of the first half of the season, he was the ace on our staff, and given the Spring Training pitching roster, nobody would have predicted that. And yet it was true. Unfortunately, not so anymore. Almost overnight, it seems, he started struggling. At first it was easy to claim that he’d had a bad day and then that he was in a slump. But being in a slump that lasts for several months and that you can’t get out of is a completely different story. And that’s what we’ve got on our hands now, plain and simple. Doubront gave up five runs on six hits over four innings. He walked two, struck out four, threw eighty-four pitches, and took the loss. His third pitch of the game was hit for a double, which turned into a run on a sac fly. He then allowed a solo shot in the third and a two-run home run in the fourth. He was replaced by Mortensen after his second pitch of the sixth inning was hit for a triple. Mortensen then allowed his inherited runner to score on a single. He had a beautiful if laborious sixth inning, during which he struck out all three of the batters he faced on a total of twenty pitches. Carpenter pitched the seventh, and Hill pitched the eighth. Bard appeared to pitch the ninth. Both literally and figuratively. As in, he made an appearance baseball-wise, and he made the appearance of pitching. The appearance, and not the act, because he didn’t pitch well. The field made a fantastic play to get an out at home, but with a runner already on base, he turned around and allowed a two-run home run the very next at-bat. The offense eventually got around to fighting back. We didn’t score until the fifth, so by the time we got on the board we were already down by five. With one out, Kalish and Podsednik hit back-to-back singles, and Kalish scored on a groundout by Pedroia. Pretty nondescript. Ciriaco walked with one out in the seventh, stole second base, and scored on a bloop single by Gomez. Also nondescript. Pedroia, leading off the fifth, hit a 3-1 fastball clocked at ninety-five miles per hour out toward the Monster for a solo shot. That was less nondescript. It’s so much fun to watch him hit home runs and to uncork that massive swing that he seems to unleash out of nowhere. With one out in the ninth, Aviles walked; one out later, he and Gomez were both coming home on Gomez’s two-run shot, also hit out toward the Monster, also powerful, also on his fifth pitch. His count was 2-2, and his pitch was a seventy-seven mile-per-hour curveball. So that makes the final score 7-5. The sad thing is that this is a team that’s been underperforming just like we’ve been; we’re actually tied for last place with the Jays. And we still lost by two. So much for a fresh start at home. Ugh. That was a very difficult loss to take. Not that we haven’t seen plenty like that already. Then again, that’s part of what makes it so difficult to take. In addition to the fact that you just don’t ever actually want to lose, I’m just so tired of losing all these games that we could just as easily win. If we could just as easily win as lose, we should just win and be done with it. We shouldn’t have had to lose this game. I will say that Buchholz wasn’t stellar. But he wasn’t terrible either. He gave up four runs on six hits while walking three and striking out five over seven innings. The second pitch he fired was hit for a solo shot, and then he gave up a walk and a single before getting a strikeout and then allowing a run on a sac fly. He didn’t cause any further damage until the sixth, when he gave up another solo shot and another walk that turned into a run on a double. In short, Buchholz was decent. He wasn’t bad, and he wasn’t good. He simply had a mediocre outing. And the reason why it’s mediocre is because lately he’s been pitching so incredibly well. If he had continued to pitch like he had when he was struggling during the first half, we might be labeling this a stellar start. But it’s all relative. For some pitchers this is stellar, and for some it isn’t. Ideally, it shouldn’t be stellar for anyone on our staff; if this is what our pitchers’ off days were to look like, we’d be in great shape. Anyway, it looked like Buchholz was receiving just enough support to get by. After two quick groundouts in the second, Salty provided an answer for one of the Angels’ two runs. The count was full, and he received a seventy-three mile-per-hour curveball that he clobbered out of the park toward right field. He was all power, and he used that cannon of a swing of his and that ball was history. Not so the Angels’ lead quite yet. We tied it up and went ahead in the fourth. Perdroia and Ellsbury hit back-to-back singles, and Lavarnway walked to load the bases. Loney then singled in Pedroia, Salty singled in Ellsbury, and Kalish grounded into a double play that plated Loney. So it wasn’t exactly a grand slam, but we manufactured our own runs and ended up clearing the originally loaded bases. Lavarnway added some insurance in the sixth when he hit a sac fly that brought in Ellsbury, who had singled to start the inning. Then, of course, Buchholz allowed more runs in the bottom of the sixth, but even with those runs we were still on top by one. So the entity that would decide our fate in this one was the relief corps, specifically Aceves, who was reinstated and given the ball in the eighth. He went one-two-three in the eighth. One inning down, one to go, and we didn’t score in the top of the ninth, so it was all him. And what did he do? He blew it. He blew the save. He induced a flyout but then hit a batter who stole second, issued a walk, and then gave up a single – it was barely a hit; it only just barely got past Pedroia’s dive – that scored one to tie it and then a sac fly that sealed the deal. It was the Angels who walked away with the win, not us, and they did it in walkoff fashion. Aceves was rewarded with a well-deserved blown save as well as a well-deserved loss. The irony was that he was suspended because he marched into Bobby V.’s office and was angry that he wasn’t given the ball in Friday’s save situation. But it’s pretty difficult to give him sympathy after last night’s performance, that’s for sure. What a game. It could have been so good. It could have been really, really great. And yet ultimately it was just so, so bad. Lester, for his part, was great. His numbers don’t even tell half the real story of how his start went. His line says that he gave up four runs on six hits over the course of six and two-thirds innings and that he walked two and struck out four and that he threw 116 pitches, sixty-six of which were strikes. But as decent as that line is for Lester, it’s not an accurate reflection of how truly good he was. He was really great. He completely shut out the Rangers through five. He faced the minimum through four, and they would have been four perfect innings if he hadn’t given up a single in the second, which ended with a double play. He finally faced one above the minimum in the fifth after allowing a single; unlike the fourth, the fifth did not end with a double play. The sixth and seventh were when the Rangers got to him. So essentially almost his entire line was created during those two innings alone, which, as I said, is obviously not an accurate reflection of how truly excellent he really was. I mean, his cut fastball was as good as I’ve ever seen it, and he mixed in his other pitches to provide a rich variety of utter devastation for Texas. He allowed a double to lead off the sixth. He notched a called strikeout for the first out of the inning, and then the run scored on a single. A groundout secured the second out but moved the runner to second, and another single brought it in. The inning ended with a flyout. The seventh was very similar; Lester induced a flyout for the frame’s first out and then gave up a walk, a single, and a sac fly that scored his third run. Then he allowed another walk and was relieved by Melancon, who gave up a single that allowed his inherited runner to score, which accounts for Lester’s final run. Clearly Lester fell apart late. He allowed all of his walks, all of his runs, and most of his hits over the course of two innings; those two walks both came in the seventh. But before that, how good was he. Yeah. Pretty good. Unfortunately, I can’t say the same for the offense, which was shut out through six. We headed into the bottom of the seventh with a four-run deficit. And I was thinking that it was going to be one of those nights. Until we ultimately, finally turned it on just in time for us to think that we might actually be able to pull out a win in this one. Three runs scored in the seventh put us within one. There was a single with one out by Salty, and a trip to first on an error with two out by Kalish. And then a pitching change. And then the huge and enormous power of Middlebrooks. It was one of those times where you knew we desperately needed something as drastic as a monster shot, and so naturally if you really need it you question whether you’re going to get it. And then you do get it and it’s almost just surreal. Except that it happened, and it was literally a monster shot because he hit it to left field and all of a sudden we scored three runs on one swing of the bat and suddenly we were right back in it. Except that the relief corps couldn’t keep us in that position. Which is pathetically funny and sadly ironic since the whole point of a relief corps is to preserve leads. Melancon gave up a walk and a single that increased the deficit to two in the eighth. And we didn’t score in the bottom of the eighth. Breslow was put in for the ninth, and he hit a batter and induced a popout before being replaced by Tazawa, who got a strikeout and then allowed a single that brought in his inherited runner. That increased the deficit to three. So after we swung the momentum back in our direction so late in the game, after we rallied to pull it together after having done absolutely nothing for most of it, after Middlebrooks powered us right back in there and made Texas’s lead unsafe, we were right back where we started in ever sense: with a loss. Salty singled in the bottom of the ninth, but then there was a double play, and we ended up going down in order. The final score was 6-3. At least it wasn’t 6-0. But after not scoring for almost the entire game and then coming back so late and then ultimately losing, it’s a very, very tough one to swallow. And as far as Pedroia not checking his swing in the ninth, he checked his swing. First base umpire Paul Nauert was wrong. I have absolutely no idea what he was looking at, but it sure wasn’t Pedroia, who was a mile off from a swing at least. Become a fan of Boston Soul on Facebook, and follow Boston Soul on Twitter!